The Mars Room is as moving as it is disturbing. Flung into a world where you feel empathy for cold-blooded killers, in the next breath you feel complete contempt for what each character has done to their life and to those around them. At first I wasn’t really sure where the story was going, it hums along like an old Lincoln Continental and creates such an intricate world that you cannot be sure where you will end up. It is languid and slow and I felt almost uneasy and hot with suspense while reading. Rachel Kushner is an incredible writer, she manages to weave the lives and stories of unlikely characters to lead to a fundamental understanding of why these characters are forced to do the things they do, yet at the same time makes you question their actions. I felt I was interrogating myself and my thoughts whenever I closed the book. In some moments I was asking myself why I was being introduced to this new person and then within a few chapters realized I need to know this character’s journey in order to understand the story as a whole. I finished the book while sitting in the security of my parent’s family home while listening to my mum’s garden fountain ebb and flow, it seemed so wrong and so final. I was free, free to do and to think while these characters were trapped in their circumstance unable to help themselves to a better future. The book seemed the epitome of confinement, the opposite of freedom; only in their thoughts can these characters attempt freedom and even then reality slaps them back into the four walls of a cell. Everything aside, The Mars Room is a must-read. The novel is so cleverly crafted that one does not squirm at some of the gory details and hardships of life but rather revels in the individuality of the various characters. Each has charisma and grit with which one can identify and empathise and yet they are each so flawed and reprehensible and deserving of their fate. Some of their actions are so unscrupulous you can’t imagine feeling empathy, and yet you do. It truly makes you think and question the actions of the individual, grapple with the notion of innocence and guilt. I found myself excusing some of the crimes committed because I had gotten to know the characters. Funny that, I am so quick to condemn in real life but for some reason Kushner makes it difficult to find some of the characters completely guilty. Their humanisation is captivating. Even as I write this I am transported to the world that she creates, thinking about the different characters and images Kushner brings to the fore. Dwight Garner from The NY Times writes “Sexual and moral boundaries will be transgressed; every shirt sleeve will be a crusty shirt sleeve, every piety an impiety, every angel a grievous angel”. That is exactly it, a crusty sleeve on a grievous angel. It is devastatingly harsh, more so because Kushner has done her research and I can only imagine how much of this is based on fact. Yet there is also humour and charm to her writing and I am now a Kushner fan for sure. 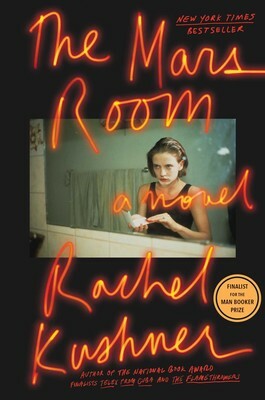 Published by Simon and Schuster, The Mars Room was a finalist for the Man Booker Prize and National Book Critics Circle Award, and was longlisted for the Andrew Carnegie Medal.